Our Wine World Direct portfolio has grown once again, and we are sharing the love! 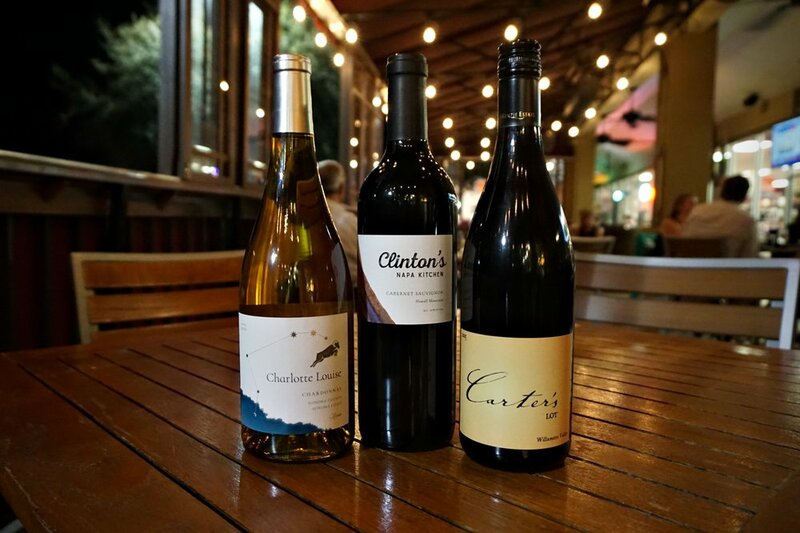 Our own private label wines, named for members of Chan's beloved family: Charlotte Louise Chardonnay (left), Clinton's Napa Kitchen Cabernet Sauvignon (middle), Carter's Lot Pinot Noir (right). Clinton’s Napa Kitchen, the new wine named in memory of Chan's son, is flying off the shelves, and each bottle raises funds for Destin Charity Wine Auction Foundation (DCWAF). We've just introduced two Clinton's wines: a Cabernet Sauvignon and a red blend. Chan recently told press: “Of course, this is a special wine for many reasons, but I think for customers what will stand out is the value. This is Howell Mountain fruit; Napa wine drinkers know the incredible quality of wine that comes from that appellation, but it's all very expensive - often hundreds of dollars per bottle. Clinton's has that same character without the price tag." Truly, we couldn't have said it better ourselves. These wines are positively delectable, and mind-blowingly impressive for the cost! The red blend is offered in our retail stores at just $24.99, and the Cabernet is $29.99! Every time a bottle of Clinton’s Napa Kitchen is sold, $2 is donated to Destin Charity Wine Auction Foundation. Once it is all sold out, DCWAF will directly funnel these proceeds to Pathways for Change, one of fifteen different charities the foundation supports, to better the lives of kids in need all over Northwest Florida. “The team at Destin Charity Wine Auction Foundation is so thankful for the continual support from our friends at Wine World. Their generosity is critical to the success of our organization, to Pathways for Change, and to the other charities we support," said DCWAF President John Russell. Only 5,000 bottles were produced (the blend and Cabernet combined), so not only is this wine amazing, but it is truly one-of-a-kind. When the last bottle has finally been sold, Clinton's Napa Kitchen wines will have raised $10,000 for the charity! If you love drinking wine for a good cause as much as we do, you cannot pass up the opportunity to give back to DCWAF this year by grabbing a bottle of Clinton’s Napa Kitchen from any Wine World location--even online. Of course, we are participating here at The Wine Bar (and The Craft Bar too)! Each glass--or carafe, or bottle--of Clinton's you enjoy with your next meal will contribute to this wonderful cause!